College student jobs aren't just for the money, they can also be a "foot in the door" on a great opportunity. The key to success in the workplace is knowing how to use your head instead of conforming to the daily 9-5 grind. The old term "work hard to get ahead" still rings true today, but a hard working creative mind can be the difference between success and failure. Yeah, I'm talking about the same job you might of done when you were 14. City or suburban paper route jobs are a piece of cake. Provided you can handle getting up early in the morning, you can make some quick cash every day for around 2 hours of work per day. A classic when it comes to college student jobs. To take it further, consider hiring some friends/family to help you deliver. Pocket a little extra for yourself for being the acting supervisor, of course. Some newspaper companies allow this, some do not. For the ones that do, sign yourself up for more and more routes, then hire some unofficial employees to deliver them for you. Eventually, you might not even be delivering any papers yourself, but still profiting of the routes. Not so much fast food, but restaurant-style eateries. Serving (waiter/waitress) is a staple college student job -- flexible hours, great pay, fun atmosphere, and hot chicks everywhere (or guys, I suppose). If you're friendly, fast, and pay attention to people needs, it's not too uncommon to leave $100+ richer on a 5 hour night-shift, smaller cafe style restaurant servers don't make anywhere near that much however. Many restaurants will hire college students without any experience, but some might prefer it. Starting as a host/hostess or busboy and then training to be a server is common. Aim to apply at restaurants with busy bars, drunk people give great tips! Federal work study positions are sponsored through your college or university, but paid for by the Government. Many colleges use work study positions to fill support roles in various departments. My position in the university library started as a work study. Many work study positions require little to no experience to get hired, you can do your homework and get paid while doing it, and you can gain valuable work experience related to your major. To look into work study positions, ask your career services advisor. These positions are funded through your financial aid (no, it will not affect your total aid package), so you could also call up your financial aid rep to get more information. I've mentioned this in another section of this website, but I think it's important enough to cover again. Jobs with non-traditional employers aren't scouted for by the masses, mostly because people are stuck in the "highschool-college-entry level" mindset. Unfortunately these kinds of opportunities are a little harder to find, but there are many in disguise. Word of advice: keep active, and let people know you are looking for work. Mowing the old lady's lawn down the street could dig up some referrals and quickly grow into your own landscaping company, catch my drift? The best way to find great college student jobs is by networking (although Craigslist ads sometimes have some really good odd job ads). Talk to people, show them you are ambitious, then when you do land some work, take it seriously and go above and beyond expectations. 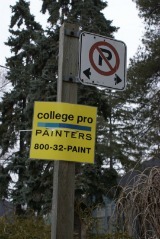 Sorry business or art majors, this may not apply to you. For those of you who major in something a little more skill-based, such as information technology, design, etc., take a close look at all the internship opportunities you find. A friend and fellow student I know accepted an internship for $25/hour because he held a certification (Cisco CCNA). Another student I know landed an internship with the State Government, starting pay was $19/hour. Not only can internships be particularly lucrative, but it's the perfect way to get your foot in the door with corporate giants. Temporary agencies (ie: Manpower and the like) is another great way to gain experience. Don't expect to earn boatloads of money however, middlemen like temp agencies have to make their money too. Instead, look at temp jobs as mini internship positions. BE PICKY when accepting temp job offers, don't go into something you don't want to do; however, temp jobs are very easy to get out of, if you don't like it, you can usually find another one quickly. College student jobs aren't for everyone. College is a good time to explore your entrepreneurial spirit. Many immensely successful people started their own brand while in college (Microsoft, Google, Dell, and many more). If you have a fresh idea, or think you could improve on an existing product or service, I would suggest to act on it while attending college. This is because you probably don't have a family, full time job, huge bills, or anything else that might tie you down. Can't think of a good business idea? Consider building websites for money.